UPDATE JAN 2017: One of the government's flagship home ownership programmes, the Help-to-Buy Mortgage Guarantee scheme, ended on 31st December 2016. It has helped more than 100,000 individuals or couples onto the property ladder. The Council of Mortgage Lenders said it had worked "exceptionally well", making mortgages more available when it started in October 2013. The Conservative led government's "Help To Buy" provides £12 billion of guarantees allowing people to buy houses with just a 5% deposit. This government guarantee enables them to take out a 95% mortgage. We pointed out in an earlier post that this subsidy is available to people buying homes for up to £600,000 - i.e. not aimed at those on modest incomes, nor at first-time-buyers. 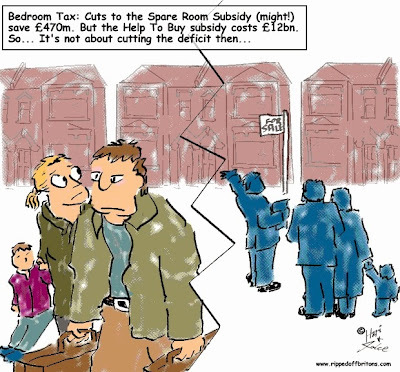 We were scolded by some, who said that while £600,000 was the upper limit the subsidy was also available for those on modest and low incomes aspiring to less than a 4 bedroom detached house in Surrey. A report by the housing charity "Shelter", released in August 2013 shows this is actually not the case. Their report shows that in almost three quarters of England families on an average (median) income could not afford the repayments on a 90% mortgage (let alone a 95% "Help To Buy" mortgage) for an average 3 bedroom home in their area. "Help To Buy" is available to everybody, but useless to most average people. For them the "Help To Buy" scheme is about as much use as the government handing out free ski passes for Verbier (a Swiss ski resort). No point having a free ski-pass if you can't afford to fly there, stay there, and hire some skis. Rather like the multitude of tax avoidance loopholes the governments past and present provide: they are available to everyone of us, but only accessible to a very few. When the opening words are Conservative led government you know this ain't subjective and may as well walk on. Hence why I stopped my church giving to shelter and went for a different homelessness charity that isn't just a lobby group. I think you mean 'objective'. Shelter actually had nothing to do with the wording. If you supported a different homelessness charity, why not share their name here so we can all have a look? It says Conservative government led because it's a coalition government led by the Conservatives with the support of the Liberal's.